Before we had sung the first full verse I was in tears. 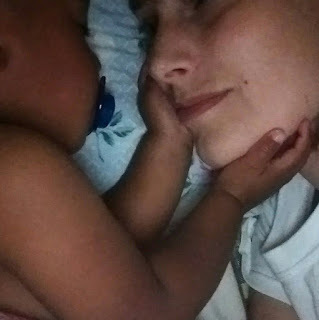 As I sat there feeding my baby his bottle, watching his eyes see the people around us singing, his chubby hands grabbing the bottle, his tiny curls resting peacefully against my chest - and IT hit me: It's Mother's Day, and that part of me that longed to be a mama all those broken years, that part of me is not broken anymore. The part of me that felt I would never be who I was made to be IS who I was made to be. Not all women feel like being a mother in who they were created to be, but I did. There were ways that God made me a mother before I ever met Genesis. In the high school girls I led in Bible study for so many years, in my best friends girls who called me "MamaLicia", in the students who called me "Mama Wenzek", even in my role as live in caregiver - I felt that maternal part of me come alive in each of these situations and I am so grateful. But I was still very broken. Some brokenness never heals this side of eternity I believe, because we live in a messed up broken world. BUT Jesus is the Redeemer Who brings beauty from ashes and binds up the brokenhearted and sets the captive free. His grace is truly amazing. I couldn't see Him clearly in those times of pain. When I realized my dream of carrying a baby would never come true I couldn't see the love in His eyes. I couldn't see that His grace could carry me through. I felt the broken pieces and edges of my life and dreams and I couldn't fully see how He could redeem this. Over the years, I kept coming to Him, offering Him my broken pieces and even when parts of my heart healed I never imagined I could feel this whole while on earth. I knew that He was with me and that His love was enough and that someday in heaven I would feel whole. This morning looking down at my sweet baby clapping his hands to the music, I realized that I feel whole in a way I never thought possible on earth. I felt content. I know I should feel content in Him no matter what, but I still longed to be a mama. He took the imperfections and brokenness of my life and brought something I couldn't have planned out even if I tried. In my grief and loss all those years ago He knew that there would be this little baby boy with perfect skin, soft curls, and big brown eyes with just a hint of lavender. He knew that he, because of the messiness and brokenness of the world, would need a mama. He knew that our paperwork would land in just the right moment for his emergency placement for adoption. He knew that Genesis' birth mother would ask for a couple with no children in the home yet, He knew that we would have just lost baby Judah and have a nursery ready for a baby boy. He knew all of this and more. And He looked with love in His eyes and He probably wished He could just tell that grieving 26 year old that her dreams wouldn't come true the way she planned, but that they would be even better. He probably wanted to tell me that even though whole was the last thing I felt in those horrible months and years that I would someday sit in a Mother's Day service and feel like Someone had taken the pieces that were scattered and broken and glued them all together with superglue - not forgotten scars, but healed and whole in His beautiful redemption. I'm whole. Not because I now have a child, but God has used this child to show me His redemption and His beautiful grace. Someday I'll be even more whole when I see my Redeemer face to face, but until then I'll rejoice in the moments of wholeness I feel because of His redemption here on earth. I'm living the life I feel like I was made to live and that is only by His grace.